This Strawberries and Sour Cream Dessert brings back great childhood memories. I love eating fresh strawberries. As a child, we went to u-pick strawberry farms, where we would pick strawberries in a field and pay by weight for what we picked. Usually we would eat more than what we picked in the basket, or at least it felt like it. Fresh picked, ripe strawberries are full of flavor. Supermarket strawberries usually taste green and tasteless, especially when you buy them when they aren’t naturally in season. 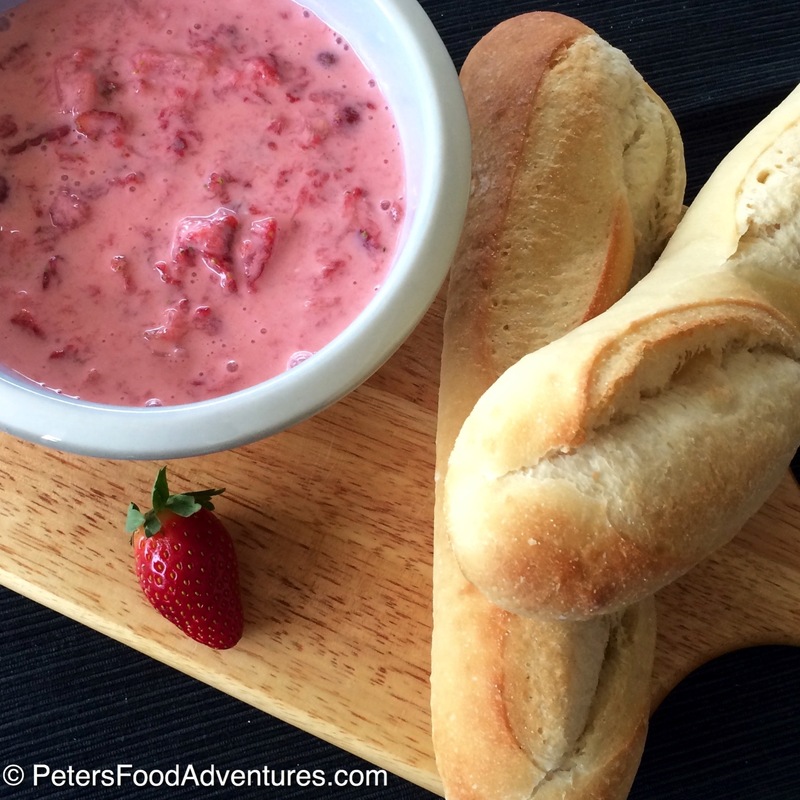 Mum would sometimes make this strawberry sour cream dessert. Honestly, I’d eat it with a spoon, and mop it up with bread, it was so good. It’s a very basic, rustic, Russian dessert. A more modern take on this recipe, uses greek yogurt instead of sour cream. The flavour is not the same for me, however, it is a healthier option. Strawberries grow quickly in a short Russian summer, and sour cream and bread are staples in Russian food. This dessert just makes delicious Russian sense. Bon Appetit! Приятного аппетита! Cut washed strawberries in half and place in a bowl. Using a potato masher, crush strawberries together. 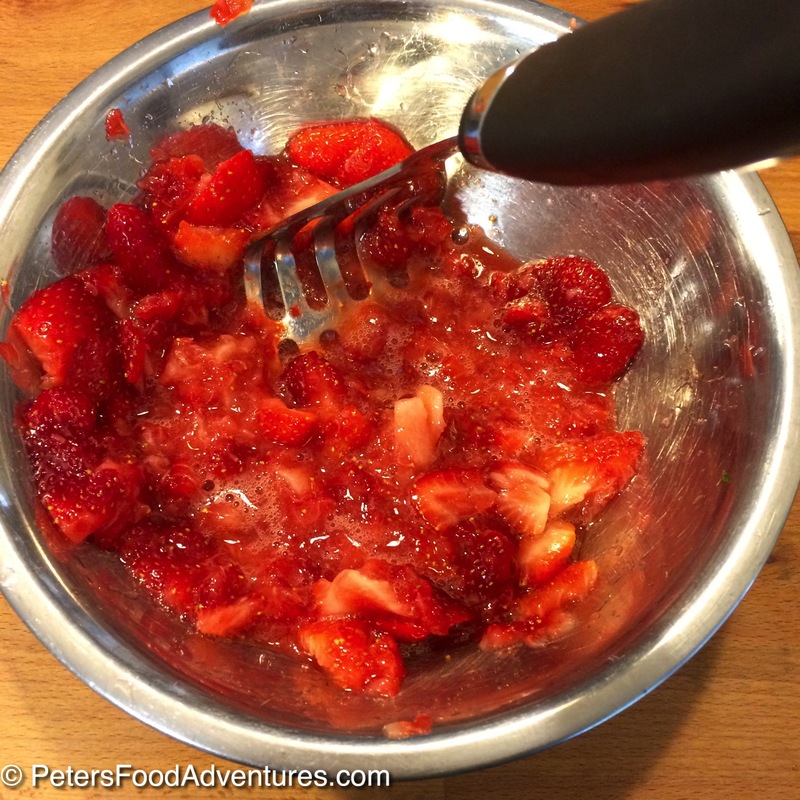 Use a wide wire masher, even wider than I used, as you want the strawberries in crushed chunky pieces. Add 2 tablespoons of sugar. Taste. Adjust to taste. Add sour cream and stir. Taste. Adjust if necessary. Serve with a baguette or a crusty loaf. As soon as I saw this post, I remembered having something like this growing up. (I lost my mom when I was at my youth age, so not many recipes was passed on). I’ll definitely give this recipe a try. Thanks for doing awesome job presenting your childhood recipe that brings us memories too.